Hester Foppen reports on ‘Partnering for Succes’ conference. 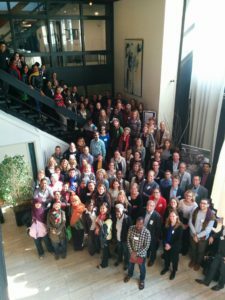 I have been submerged for two days in an inspiring joint inquiry on how partnerships learn during the conference ‘Partnering for Success’ in Wageningen on 17th and 18th March 2016. This international event focused on partnerships related to public, private and civil society collaboration between European, African and Asian countries with a target towards reaching SDGs. In his keynote speech, Bruce Byiers from ECDPM focused on EU-Africa relations and private sector engagement. He introduced the audience to the field of M&E around partnerships, showing four examples. The private sector partners which Bruce mentioned were driven by a variety of motives, from exploring new markets to license to operate, reputation or philanthropy. There were no experiences presented from Asian companies.I would be curious to know how the latter maintain their ‘license to operate’ in Africa: probably by their investments and the tangible services they deliver? If this field interests you, I refer to some researchers and publications, mainly on Chinese investments in Africa[i]. After Bruce, Ros Tennyson was introduced as ‘ the grandmother of partnerships’, a title which she gladly accepted by telling that way back in the nineties she was asked by the International Business Leaders Forum to work with them. Coming from the world of theatre, she came in as an absolute skeptic on business. The first thing she did was bring in university to dive into what she calls ‘the glue of partnerships’. Ros describes partnerships as ‘an ongoing relationship in which risks and benefits are shared’. Important for effective partnerships is that all contributions are valued and that the added value of the partnership will be co-created. Ros is passionate about partnerships doing unexpected things and states that donors can make or break partnerships by allowing space or narrowing it down. Some partnerships are more like service agreements with one lead partner – which is not bad, but which most of the time are not very transformational. For partnerships, imagination is a key element, and giving up control, knowing that you may get something in return. Partnership brokering is the ideal position to reflect on partnerships and support them. A partnership broker needs to be sharp on the added value of a partnership and should be the ‘storyteller’: capturing the history just as it happened is what makes that the partnerships will continue after the intervention has ended. A broker position is temporary, while partnerships are there to stay, at least, if this is what their ambition is. A broker should always evaluate his own role: am I doing too much, or too little. What is needed is passion and objectivity at the same time. The importance of monitoring not only the content but also the process of the partnership is gradually getting more acknowledged – although it is difficult to tell if all partners will take the time to do self-assessments and participate in learning sessions. It will require a special effort from the partnership broker or facilitator to make it attractive. CSOs and knowledge institutes may not be the most difficult partners to convince, but for ever busy companies and local government bodies it may prove to be less easy to dedicate time and resources in joint learning. And it will help if donor organizations see the benefit of partnership learning and allocate budget for it. Within my own organization Aqua for All we use a tool called ‘Continuous Learning, Improving and Creating Knowledge’ (CLICK), and we are beginning to get some experience with it which explains my interest to see what PPP monitoring and learning tools have been developed by other organizations. A Dutch organization with longtime experience with using a partnership monitoring tool is MDF. Rene Vermeulen presented two MDF tools: the ‘Alliance Thermometer’ to assess the state of a partnership and its chance for success, and the ‘Collaborative Outcome Reporting’ (COR) , a method which brings all stakeholders together to discuss findings of an evaluation – which turns evaluation findings into input for further partnership development. Rob van Tulder and Stella Pfisterer from PRC, one of the five partners in the ‘Promoting Effective Partnering’ initiative (PEP), presented their newly designed ‘Navigator for partnering impact‘. This tool is designed for the early stage of partnerships and contains guiding questions to drive systemic learning around SDG partnering. Each question contains a pop up for further reading and the scoring of the question is visualized with a traffic light, which helps to see the change in performance of each topic over time. PRC is calling for PPP’s to test the tool to jointly improve it. PPPLab (Joost Guijt and Anja Wolsky) presented the ‘Partnership Assessment Tool’ which is adapted from an existing tool and converted into a practical online self assessment tool. The PAT tool can be used by partnership members as input for reflection on the partnership process. Just like the tool from PRC, the PAT tool from PPPLab still needs to be further tested and improved. ‘There is always a reason why people do what they do, and why they do it’ . ‘Successful partnerships build on a deep appreciation of each other’s role and strengthen relations for future challenge’ . Hardus, Sarah, 2013: http://www.thebrokeronline.eu/Blogs/Emerged-Powers/Trilateral-cooperation-not-the-panacea-to-China-in-Africa Sarah Hardus works at the UvA, and is lecturer International Political Economy and Development at ISS in The Hague and the Erasmus University. Her research field is the influence of Chinese financing in Africa on traditional Western development policy.